Why Sean Muphy? 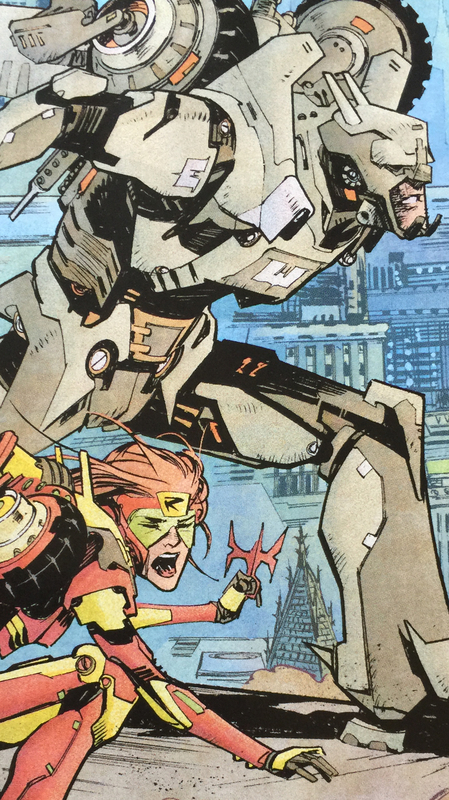 Sean Murphy has done amazing work with some of the industries best writers. Back in 2010 he penciled Joe The Barbarian with scribe Grant Morrison , a limited series published under DC’s Vertigo imprint. Joe The Barbarian is a story that follows a young type 1 diabetic teenage boy that falls into a state of hypoglycemia and starts to hallucinate a fantasy world that is comprised of toys and story book characters from his youth. Grant Morrison does it again, he produces yet another great read. Continuing in the same fantasy vein, Murphy follows up Joe The Barbarian with another Vertigo limited series with Scott Snyder entitled The Wake in 2013. This sci-fi/horror tale takes human evolution in a different direction. The story starts in modern day in an underwater facility where a drilling crew has trapped a horrific creature, then jumps us 200 years into a flooded dystopian future to see the fate of human-kind. This is a real fun sci-fi horror read. Scott Snyder always delivers and Murphy is great. The first half of this free book is a reprint of Detective Comics vol 1 #27, the first appearance of Batman. 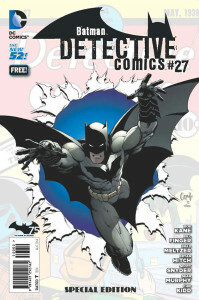 The second half of the book is two re-printed tales from Detective Comics Vol 2 #27. The first being Brad Meltzer and Byran Hitch‘s modern retelling of Batman’s first appearance and the second is a reprint of Scott Snyder and Sean Murphy‘s story entitled “27”. During the monologue Sean Murphy gives us a montage of countless future versions of Batman and Robin. We see a Mad Max/DeathRace version, a Robotech Cyclone looking suit and a slightly skewed Batman Beyond take. All of this culminates into decision day. Bruce must decide if he will take on the mantle or not. Of course we know what he decides and thus the story never ends. “27” has that great look and feel of an Elseworlds story. Fun, what if type scenario, that makes comics enjoyable. If you haven’t picked up a copy of Detective Comics Vol 2 #27, you should stop by your local retailer and ask them if they have a copy of the Free Detective Comics #27. Its free, so what do you have to lose? So is Scott Snyder and Sean Murphy‘s story a fun what if/Elseworlds story? or does it play a role in the current Bat-Verse continuity? If you are current reader of Batman and you haven’t read Batman Vol 2 #43, then may want to skip the spoiler below. Otherwise click the thumbnail and see how “27” ties into current DC New 52 continuity. Like what we’re talking about? Then hit me up on twitter and/or our facebook or google+ page and let me know what you like or don’t like.